The collapse of the Roman Empire occurred in a single generation and was not so much the result of invasions by their enemies, but the result of moral decay and internal corruption. Similar patterns are emerging in America and the elimination of the Christian cross is one of the most significant symbols of that cultural decay. Today, forces are at work to strip this "dangerous symbol" from public venues and to minimise its significance. Many Muslim leaders are convinced that when Christianity disintegrates it will create a spiritual vacuum in the West -- and their extreme brand of Islam will rush in to fill that void. They believe that Western civilisation will become so decadent that America will collapse like a house of cards. 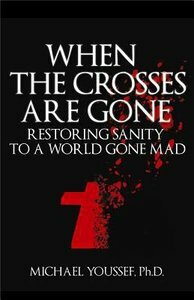 Dr Youssef writes that Christians must stand up against these attacks and defend the cross as a symbol of the love and grace of God, and he provides a diagnosis of the insanity of the current culture and a prescription for restoring sanity to a world gone mad. About "When the Crosses Are Gone"